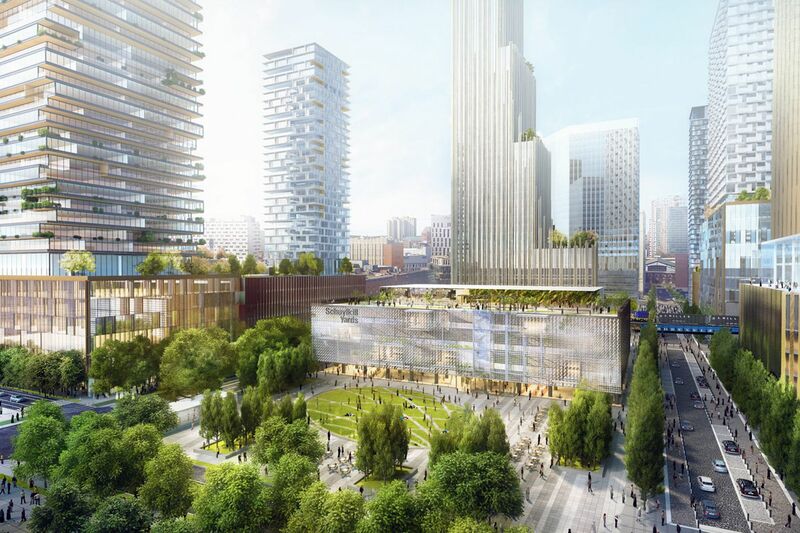 Artist’s rendering of planned Schuylkill Yards development, with renovated One Drexel Plaza, future home to Spark Therapeutics in foreground. Spark Therapeutics Inc., a commercial gene therapy company, will move into the first planned component of the massive Schuylkill Yards development in University City in an expansion of its research and development operations that is expected to create 500 new jobs. Spark will occupy at least 180,000 square feet, with the option of expanding into 300,000 square feet, at the One Drexel Plaza office building at 3001 Market St., Michael Gerber, a spokesman for the Pennsylvania Department of Community and Economic Development, said in an interview Thursday. Spark is now headquartered at 3737 Market St., but began seeking more space following the 2017 U.S. Food and Drug Administration approval and 2018 launch of its first gene therapy, Spark said in a release. "This expansion is proof of our continued commitment to research, development, and innovation in West Philadelphia and of our determination to offer new genetic treatments for people living with genetic diseases," chief executive Jeffrey D. Marrazzo said in the release. Aside from its headquarters space, Spark currently occupies offices in the FMC Tower, at 2929 Walnut St. It was not known what, if any, of its existing office space it would retain after moving into One Drexel Plaza. The company received DCED funding for the move from a $2 million Pennsylvania First grant related to the projected job growth and a $7.5 million grant from the Redevelopment Assistance Capital Program. The 500 new jobs created through the expansion would be in addition to 262 employees currently in Philadelphia, Gerber said. Spark's total worldwide workforce is about 350, it said in the release. Developer Brandywine Realty Trust last year acquired One Drexel Plaza, the former home of the Philadelphia Bulletin newspaper, from Drexel University with plans to renovate the building into modern offices as part of its Schuylkill Yards proposal for the area west and northwest of 30th Street Station that involves 1.6 million square feet of labs, offices, shops, and dwelling units. "In addition to creating hundreds of additional high-paying jobs at the new facility, the project will help spur further development at Schuylkill Yards that will provide even more economic benefit to the area," Gov. Wolf said in the release.